Shelf Inflicted: Calling All Smegheads! The first lesson Lister learned about space travel was you should never try it. But Lister didn't have a choice. All he remembered was going on a birthday celebration pub crawl through London. When he came to his senses again, with nothing in his pockets but a passport in the name of Emily Berkenstein. I'm not usually a fan of book tie ins with movies and television but this was so much like the BBC show's episodes in book format that of course I loved it! I've been a fan of the show since it started and was gleeful when I found there were actually novels I had to at least try them. 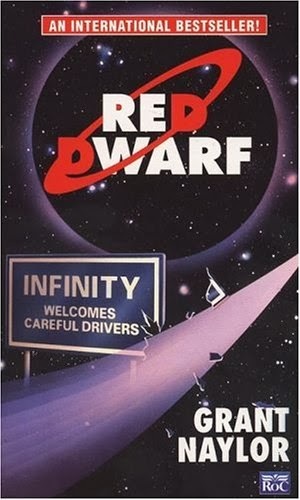 It tells the tale of the Red Dwarf crew from the start. It includes a lot of what was in the first two series as well as a ton of details that you wouldn't know if that was your only source. Then it throws in whole new story lines and tangents. 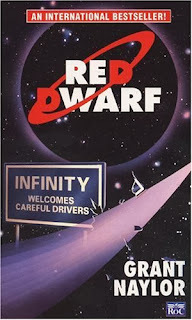 Lister's back story of how he ended up on Red Dwarf was something I had wanted to know for a long time. Definitely a fun read, and one that captured the essence of the series quite well. Better than Life was just as enjoyable, but the Last Human fell flat for me - I think it really suffered from Grant's absence. I'm still curious about Backwards, but I can't help but wonder if Grant without Naylor will leave me with the same feeling as Naylor without Grant. Backwards was decent but not the best of the lot. Last human was pretty much abysmal but worth reading for more info on the crew. Didn't know this existed! Huzzah!